An Early Beauty Lover’s Christmas Wishlist.. | Becky Alyssa's Beauty Box. 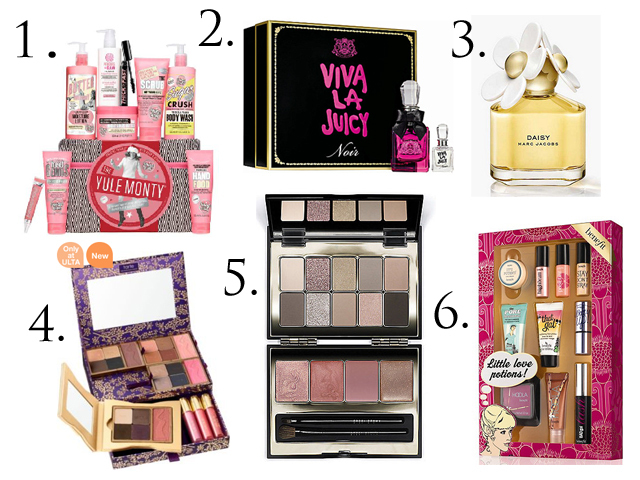 An Early Beauty Lover’s Christmas Wishlist..
Oh no, it’s November already! You’ve probably already been reminded that it’s Christmas next month (just under 8 weeks, eek!) and if you’ve yet to do any present shopping, the idea of the holidays drawing ever closer is rather terrifying. I’ve already bought a few things present-wise, but I’m leaving the larger items until December so they can be returned with a receipt if needed. Despite the awful weather, all the shops have suddenly got so busy – I can’t believe how many others are already buying their holiday gifts. I hope nothing I have my eye on will sell out anytime soon! I’m taking advantage of this horribly rainy evening by compiling a short Christmas wishlist of beautiful pieces I’ve seen already and know I just have to have! And just in case you’re looking forward to buying a gift for the picky beauty lover in your life who seems to have everything, I’m certain even the most fickle ladies would be thrilled to find any of these beauties under their tree! 1. Soap & Glory ‘The Yule Monty’ Gift Set: £60 – How fantastic does this year’s enormous Soap & Glory gift set look?! After trying out a couple of their sweet-smelling scrubs and body butters, I can’t think of a better well-rounded gift set that almost everyone will enjoy not just for Christmas but throughout next year as well. Top picks are the Thick & Fast Mascara for super-thick volumised lashes, the Righteous Butter for sweet-smelling soft skin throughout the chilly weather and the delicious Hand Food to keep hands smooth and lovely. The Soap & Glory sets always sell out fast near Christmas, so pick yours up asap if you haven’t already! 2. Juicy Couture Viva La Juicy Noir Gift Set: £35 – Viva La Juicy is one of my favourite fragrances and the fruitier, muskier Noir edition just made me love it even more. This set contains a full size 30ml bottle for your dresser as well as an adorable mini 5ml for your suitcase or handbag. I prefer this to sets containing body lotions or shower gels – minis of your favourite scent are always more useful than yet another body wash or lotion. 3. Marc Jacobs Daisy EDT 100ml: £64 – In my eyes, Marc Jacobs can do little wrong – I adore my treasured MJ Petal To The Metal handbag and his fragrances have yet to disappoint. This very pretty mega-size bottle of one of my ultimate favourite fruity-floral fragrances would look beautiful on my dressing table and ensures I’ll always have plenty to hand! 4. Tarte Gorgeous Getaways Portable Palette Set: $48 (US only) – I couldn’t exactly do a wishlist without touching on my beloved Tarte, could I? Far from yet another boring palette, highlights of this set include 4 of the bestselling Amazonian Clay blushes in brand new shades, 3 limited edition lip glosses and best of all, pans can be removed from the palette into a portable mini compact, all shades interchangeable so you can create your own travel-size Tarte palette. Amazing! Sadly, Ulta doesn’t ship to the UK (wah!) but this is an incredible deal if you can get your hands on it – I love the idea of a mini customisable palette of these quality products that I can switch around as I like. And pick one up for me too, please? 5. Bobbi Brown Twilight Pink Lip & Eye Palette: £59 – Those shadows – how gorgeous! This beautiful festive palette contains a variety of 10 mix-and-match shades for any occasion which would look beautiful on any skin tone. Bobbi Brown is the queen of natural, versatile and flattering products so it’s no surprise I love this! In addition to these stunning shadows, the palette also includes 4 shades of Creamy Lip Color along with a quality BB brush to apply it with. Normally I ignore lip products in palettes as the brushes are usually rubbish (if there is even one included) – this quality palette contains everything you need for switching up your look whilst travelling. 6. Benefit Little Love Potions set: £29.50 – A Christmas wishlist wouldn’t be complete without a Benefit set, would it? This set is stuffed with 10 of your favourite Benefit products, meaning each product works out as just £2.95 each. My favourites include the Hoola bronzer (the perfect matte bronzer for light skin) and the PoreFessional primer (a super-smooth base for your foundation). I really want to try the Watt’s Up concealer and Posie Tint as well! These minis last a surprisingly long time so make sure you put one of these fabulous value sets on your list! You could even split the set up to cover gifts for several friends, making it even more cost-effective. I’m sure there will be plenty more to add onto my wishlist as the 25th of December approaches, but these are my favourite that I’ve discovered so far. I’m really hoping to get hold of the Tarte palette and the undeniably beautiful Bobbi Brown palette in particular! What’s on your Christmas list this year? Have you done any gift shopping yet? Or are you staying out of the madness altogether and heading away for the holidays? ← The Best Acrylic Makeup Storage..For Under £20!